Amazing clear blue skull figurine makes a provocative paperweight or desk ornament! Human beings have been enthralled with skull symbolism and Quartz Crystal skulls since prehistoric times. 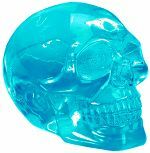 Lucite Blue Crystal Skull also available in clear Red or Gold Topaz colors. 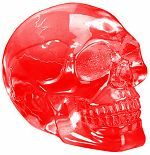 Red clear lucite skull bust to add to your skull collection. Also available in clear Blue above or Gold Topaz colors. Gold clear lucite skull bust is a great power object to add to your desk or room decor. Also available in clear Blue above or Ruby Red colors. Celtic etchings give this gun metal finish skull an authentic and artistic appearance. Carving skulls was an ancient ancestor worship custom. Cold cast resin figurine packed in gift box. 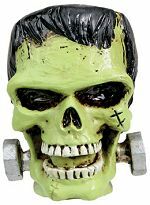 Add the sickly green Frankenskull to your collection. It looks like Donald Trump stole his hair style! Hand painted cold cast resin figurine packed in gift box. Mad Hatter Skull has his unlucky number close at hand. Hand painted cold cast resin desk paperweight or figurine packed in glossy silver gift box. Join the retro trend with this commemorative Easy Rider Skull. Those were the good old days! Hand painted cold cast resin desk paperweight or figurine packed in glossy silver gift box. 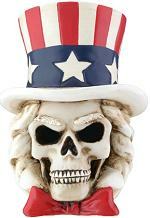 Uncle Sam Mad Hatter Skull sports the Red, White and Blue with matching red bowtie. Hand painted cold cast resin desk paperweight or figurine packed in glossy silver gift box. St Patrick's green Mad Hatter Skull with spiffy clover green bowtie. Hand painted cold cast resin desk paperweight or figurine packed in glossy silver gift box. For your Civil War collection, a war weary Union Soldier Skull. Hand painted cold cast resin desk paperweight or figurine packed in glossy silver gift box.